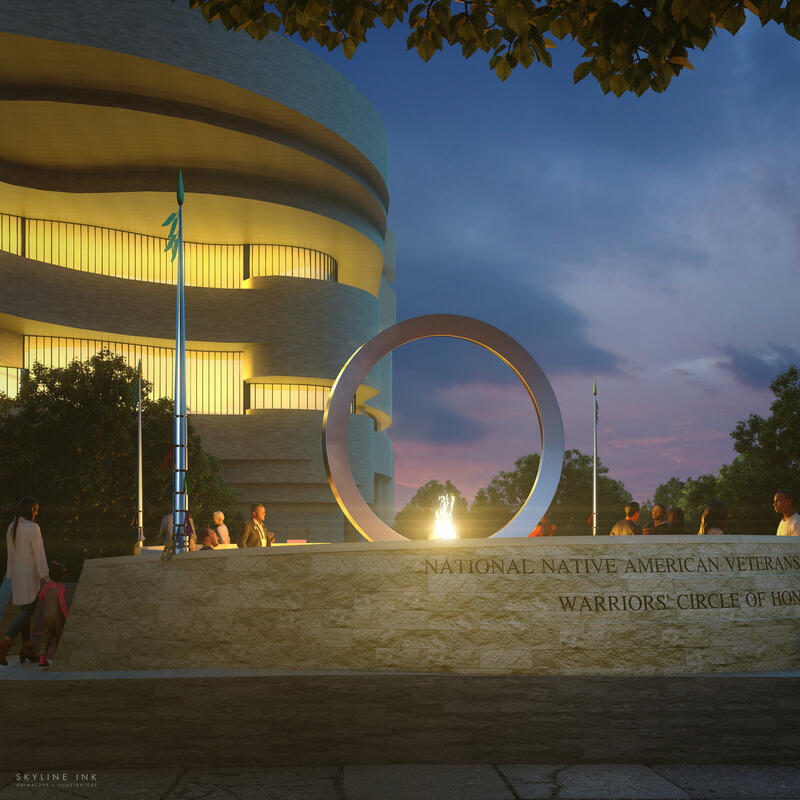 The National Museum of the American Indian announced its winning design for the National Native American Veterans Memorial. The multimedia artist Harvey Pratt's Warriors' Circle of Honor will incorporate an enormous, upright stainless steel circle. The memorial will sit on the National Mall in Washington, D.C., and Pratt envisions a clear view of the U.S. Capitol's dome from there. As Smithsonian.com has reported, Pratt's use of circles suggests "the cycle of life and death, and the continuity of all things." The stone drum, it adds, symbolizes an invitation for people to "harmonize their experiences" with one another to the "silent rhythms" of the drumbeat. Pratt was born in Guthrie, Okla., and is a citizen of the Cheyenne and Arapaho nations. He's a veteran of the Marine Corps and served in Vietnam from 1962 to 1965. He also worked as a forensic artist for years, creating witness description drawings for law enforcement. Pratt tells NPR's Mary Louise Kelly that he hopes his design will function as an architectural piece rather than just a work of sculpture — something that people can become a part of. He says he can picture people taking a seat on the benches tucked into the drum fountain and reflecting on their own experiences with the military. He also hopes that it might be a cathartic place for some veterans. "Most nations have veterans tell stories about what they did," Pratt says. "People can come in there and do that and be comforted, and get rid of some things that are on their minds that bother them." More than 150,000 veterans identified as American Indian and Alaska Native in the 2010 census. And according to the U.S. Department of Defense, there are more than 20,000 active duty service members in the military who identify as American Indian or Alaska Native. The memorial was selected unanimously by an eight-person jury of Native and non-Native artists, designers, museum directors and veterans. It acknowledges the history and service of American Indian, Alaska Native and Native Hawaiian veterans, according to the museum's director, Kevin Gover, who is a citizen of the Pawnee Tribe of Oklahoma. Gover says that throughout the process of helping plan the memorial, he has met thousands of Native American veterans who have demonstrated over and over their commitment to the U.S.
"These veterans are perfectly aware that they are serving a country that had not kept its commitments to Native people, and yet they chose — and are still choosing — to serve," Gover says. "This reflects a very deep kind of patriotism. I can think of no finer example of service to the United States and the promise it holds." The memorial will break ground on Sept. 21, 2019, and be unveiled in late 2020. "I want it to be a place of healing and comfort, and a place that's hopefully going to be built on love," Pratt says. Today, the Smithsonian revealed its winning design to commemorate Native American veterans. They selected the work of Oklahoma artist Harvey Pratt. Here is how he describes the memorial, which he designed and which will be placed on the National Mall. HARVEY PRATT: I have a 12-foot metal circle upright and a drum holding that - a drum that is covered with moving water that flows over it. KELLY: Pratt has Cheyenne, Sioux and Arapaho heritage, and he served in the Vietnam War where he was attached to a Marine combat unit. 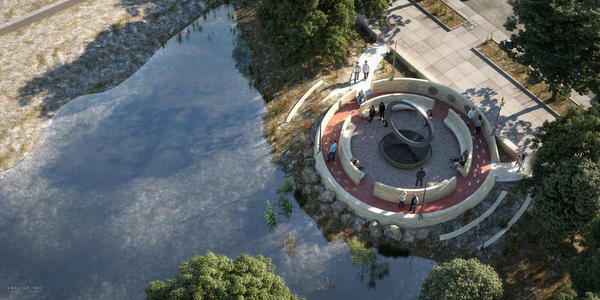 Pratt spoke with us from member station KGOU in Norman, Okla., about his design, which is titled Warriors' Circle Of Honor. PRATT: My design is made to - people to interact, to come into it. It's not a statue. It's an architectural piece. And it has the five military seals carved into the stone on the east wall. KELLY: Of each of the five services. KELLY: And it's interesting to hear you say it's not a statue, the distinction for you being - what? - you want it to be more alive than statue implies? PRATT: I want it to be interactive so that people can actually come inside and Native people and visitors can see war veterans that may come in there and tell a war story or their war mothers will tell a story about their family or their loved ones that is currently overseas or had been at one time. And there's a fire - there's a flame inside of the upright circle and the water below that. And those are all elements that Native American people use - water, fire and wind and the earth. And so I incorporated those into my design because most tribes use those elements. Fire is purity and kind of hardens us, and it comforts us. And what I wanted my memorial to be is that when people come in there, they can make their promises or vows. They can use the water to bless themselves. And other people can observe that. KELLY: Well - because this was part of the mandate, as I understand it. When Congress commissioned it, the idea was this needs to be something that all Americans can come and appreciate and learn about the tradition of Native American service. PRATT: Yes. You know, the 650 tribes in the nation - we're all the same, but we're different. And so I made it simple enough that different tribes could recognize certain things in whatever they want to use in those designs that they can use for their ceremony for their veterans. And most nations have veterans tell stories about what they did. And people can come in there and do that and be comforted, you know, and get rid of some things, you know, that's on their mind that bothers them. That's what I want to happen, that this place will become a place of love and healing and comfort and soothe the people. KELLY: I read that when you were a little boy growing up that you were told, you know, when your family would see veterans walking past, they'd say, hey, go shake those men's hand. KELLY: That stayed with you. PRATT: Yeah, it always has. Veterans are such a big part of our lives. When we have ceremonies, Native people sing a flag song to honor the American flag, and then they sing a song for veterans, and then they sing a song for victory. And that happens at everything. So it's just part of our nature. It's just part of the things that we do as Native people. KELLY: And why is that? Why is military service and honoring it so important in Native culture? KELLY: Oh, really? You always wanted to go off and serve. PRATT: Yes. That was just part of the something that I thought I had to do. My grandfather taught us to go without water, to put a little rock in our pocket and when we ran out of water, we'd put that rock in our mouth, and he said you can make your own water. And we'd pound up a little dry meat and put it in your mouth, and you'd make gravy, you know. So it's just little things that were done to me growing up over the years, you know, that always made me a part of this warrior society. KELLY: A part of instilling this mindset. KELLY: It must be quite something now to have designed a work that's going to honor all of those who came before and all of those who follow after you on that path. That's something that's going to stand on the Mall. PRATT: ...To say that my design was chosen to stand on the Mall at Washington, D.C., among all the other sacred memorials and sacred places. KELLY: Well, Harvey Pratt, congratulations. PRATT: Thank you so much. KELLY: Harvey Pratt, veteran, Oklahoma native and the winner announced today for the design of the National Native American veterans memorial. That memorial is expected to be opened by the end of 2020. Transcript provided by NPR, Copyright NPR.